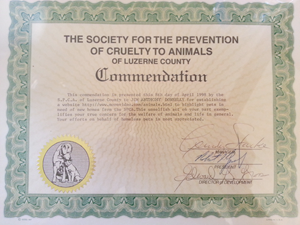 Pets On Board started in Wilkes-Barre, PA in 1995 when owner James A. Donnelly wanted to help animals online when he discovered that online adoptions did not exist. Donnelly set out to give web development a try experimenting with the world wide web in 1992. Digital cameras did not exist to the level of today and were extremely expensive. Donnelly used his existing video camera making still images of local dogs and cats from the Luzerne County SPCA and making his animal website on his video page moonvideo as a trial. Later PetsOnBoard.com was born and gained popularity when it was featured on local WBRE-TV and later an NBC featured national story. NBC National TV Story about PetsOnBoard.com being one the first online pet sites back in 1995-1996. Dawn Timmeny Reporting NBC. PetsOnBoard.com, SPCA Commendation 1997- Helping Animals Online Since 1995! Don’t Buy, Adopt, Rescue or Foster an animal today and Save a Life! James A. Donnelly and Ed Gross Director SPCA Pets On Board started in Wilkes-Barre, PA back in 1995 when owner James A. Donnelly wanted to help animals online when he discovered that online adoptions did not exist. PetsOnBoard gained popularity when it was featured on local WBRE-TV and later an NBC featured national story.